• We’re expecting a chance of rain and snow before 10 a.m. today, with the weather clearing and a high of 47 degrees this afternoon, setting off a nice warm week, with a high near 45 on Tuesday, light rain Tuesday night, 52 degrees on Wednesday and a high around 42 on Thursday, according to the National Weather Service. There are now less than 12 full days until spring. 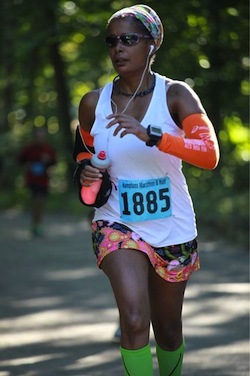 Joi Jackson-Perle of Wainscott is running the Suffolk Marathon in honor of Lance Cpl. Jordan Haerter of Sag Harbor. • Suffolk County Executive Steve Bellone has launched a “Faces of the Race” campaign to highlight runners registered for the inaugural Suffolk County Marathon & Half Marathon in support of veterans on September 13. At right, runner Joi Jackson-Perle of Wainscott is running the marathon in honor of Lance Cpl. Jordan Haerter of Sag Harbor, who was killed in Iraq in 2008. The stories of other race participants are on the race’s website and Mr. Bellone’s Facebook page. Registration is still open for the marathon, which begins at Heckscher State Park and passes through downtown Oakdale, Sayville, Bayport, Blue Point and Patchogue. • There was a bit of gentle chiding but a whole lot of humility in the room when Southold and Southampton towns gathered together in Southampton’s First Presbyterian Church Saturday afternoon to pay homage to both towns’ 375th anniversaries. The Beacon’s full story is online here. • The U.S. Environmental Protection Agency is helping Suffolk County evaluate the health impacts of several proposed changes to the county’s septic code that could have a serious impact on East End homeowners. The Beacon’s full story is online here. • The Beacon’s Week in Review was delivered to inboxes throughout the East End in the wee hours of this morning. Get your own free copy, or help your friends get their own free copy each week by signing up here.